This PDF 1.5 document has been generated by Acrobat PDFMaker 11 for Word / Adobe PDF Library 11.0, and has been sent on pdf-archive.com on 07/01/2018 at 22:29, from IP address 73.162.x.x. The current document download page has been viewed 109 times. File size: 62 KB (5 pages). the massively parallel testing of thousands of sequences for enhancer activity. exons function as tissue-specific enhancers of nearby genes. Genome Research 2012,22: 1059-1068.
and human evolution, PLoS Genetics, 2013: e1003221. PMCID: PMC3547868. Nature Genetics 2013, 45: 1021-1028. PMCID: PMC3775494. Transcriptomic and epigenomic characterization of the developing bat wing, Nature Genetics 2016, 48:52836. PMCID: PMC4848140. 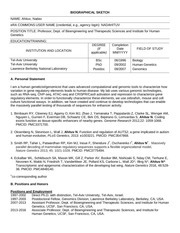 Direct Ph.D. with distinction, Tel-Aviv University, Tel-Aviv, Israel. Postdoctoral Fellow, Genomics Division, Lawrence Berkeley Laboratory, Berkeley, CA, USA. Genetics, UCSF, San Francisco, CA, USA. Human Genetics, UCSF, San Francisco, CA, USA. testing of thousands of candidate sequences for regulatory activity termed massively parallel reporter assays. elements yields viable mice, PLoS Biology 2007; 5:e234. PMCID: PMC1964772. enhancers in vivo, Nature Biotechnology, 2012, 30: 265-270. PMCID: PMC3402344. c. Smith RP, Taher L, Patwardhan RP, Kim MJ, Inoue F, Shendure J^, Ovcharenko I^, Ahituv N^. model, Nature Genetics 2013, 45: 1021-1028. PMCID: PMC3775494. enhancer activity, Genome Research, 2017, 27: 38-52. PMCID: PMC5204343. AM, Nguyen L, Gurrieri F, Everman DB, Schwartz CE, Birk OS, Bejerano G, Lomvardas S, Ahituv N.
enhancers in the developing limb, Development 2014, 141:4194-4198. PMCID: PMC4302890. Locus, PLoS Genetics 2016, 12: e1005738. PMCID: PMC4809552. Genetics 2016, 48:528-36. PMCID: PMC4848140. both in genes and in enhancers with obesity susceptibility. Genetics 2007; 80: 779-791. PMC1852707. heavy weight problem, Genome Research 2008; 18:214-220. PMC2203619. d. Kim MJ, Oksenberg N, Hoffmann TJ, Vaisse C, Ahituv N. Functional characterization of SIMassociated enhancers, Human Molecular Genetics 2014, 23: 1700-1708. PMCID: PMC3943516. in autism and human evolution, PLoS Genetics, 2013: e1003221. PMCID: PMC3547868. Nature 2013, 504: 306-310. PMCID: PMC3954713. 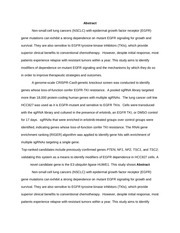 expression and guides synthetic regulatory element design, Genome Biology, 2013, 14: R72. genes, Translational Psychiatry 2014, 2: e431. PMCID: PMC4199417. Clinical Pharmacology and Therapeutics 2011, 89: 571-578.
discovery of drug-dependent human liver regulatory elements, PLoS Genetics 2014, 10:e1004648. of metformin hepatic response, PLoS Genetics 2016, 12: e1006449. PMCID: PMC5130177. causally contribute to human disease. The major goal of this project is to characterize the genetic causes of idiopathic scoliosis. ENCODE-annotated candidate regulatory elements for their function. role in drug response pathways. The major goal of this project is to characterize the regulatory logic of human adult liver enhancers. The major goal of this project is to characterize regulatory elements associated with AUTS2 regulation. could lead to human limb malformations. elements in a massively parallel cost efficient manner. The major goal of this project is to identify and characterize epilepsy-associated gene regulatory elements. The major goal of this project is to link nucleotide variants in the SIM1 gene region to obesity susceptibility. This file has been shared by a user of PDF Archive. Document ID: 00718045.